SEOUL, South Korea — South Korean President Moon Jae-in said Tuesday that there can be no military action on the Korean peninsula without Seoul's consent and that the government would prevent war by all means. Moon made the remarks in a televised speech to commemorate the 72nd anniversary of the nation's liberation from Japanese military rule in 1945. 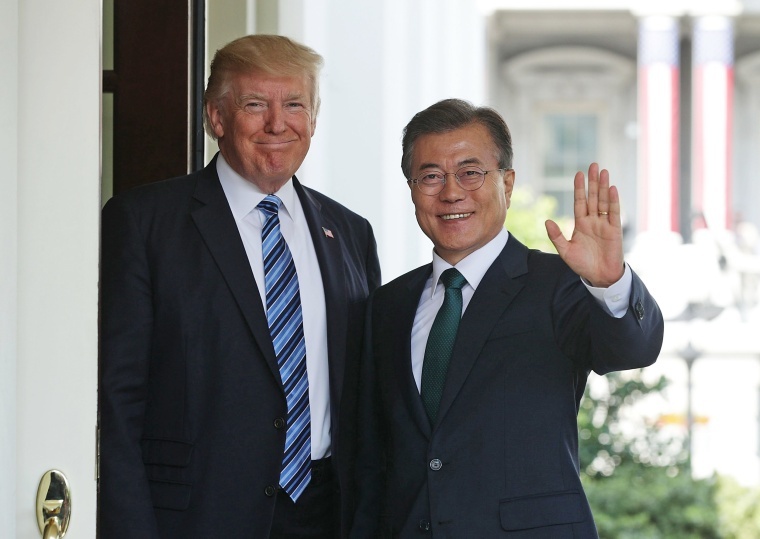 Presidents before Moon, who took office in May, have traditionally made North Korea the core of their speeches, focusing mainly on policy to engage Pyongyang. "The government, putting everything on the line, will block war by all means," Moon said Tuesday, saying sanctions against North Korea are intended only to lead it to negotiations. Tensions have increased as North Korea has advanced toward being able to hit the mainland United States with a nuclear-armed missile. Its state media on Tuesday described in detail its plans to launch missiles into waters near Guam, but it also reported that leader Kim Jong Un would monitor U.S. conduct before giving orders for the test — appearing to signal a path to defuse the crisis. "I call upon the North Korean government: Without international cooperation and co-existence economic development is impossible," Moon said. "If you continue on this path, there will only be international isolation and a dark future."